I recently discovered a way to see the wild animals that surround us without the standard hiking hazards of getting eaten by bugs or bears. I bought a cheapo 8-megapixel Game Camera at Walmart for under $30. (This is less than a week’s supply of bug repellant in ‘Black Fly Season’!) What a Game Camera does is take either pictures or videos when it senses movement, either during the day or at night. Now that I am a Geezer, I actually read the included directions and bought 8 fresh batteries, as the camera requires a lot. I already had a tripod and an “SD Card” for storing the shots, so I set it up out front and let it do it’s thing at the bird feeders. I was delighted in the camera’s performance. It will take hundreds of shots during any given 8 hour period, so edit and save the best on your computer. Here are some photo samples from my first week. One thing about getting good close ups is you see things you miss in real time watching the wildlife, such as the size of the claws on that Gray Squirrel. As I got familiar with the camera, I had to block off most of the Infrared emitters when I started in shooting close ups, like of the Raccoon at 11:02 PM, Saturday, May 5th. Please note, I personally was sound asleep at that moment, having assigned the Game Camera to sentry duty. I used a hole punch and blue painter’s tape, placing a dot over each emitter. 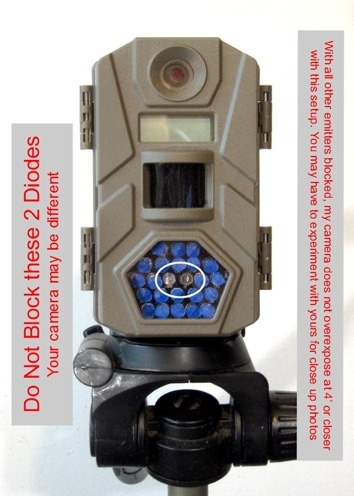 On my camera, there are 2 that you must not cover, otherwise it won’t detect at night. Blocking the Infrared Emitting Diodes only affects the exposure when shooting at night. Hunters want to illuminate animal photos up to 100 feet away, but that much power washes out all detail when shooting subjects 10 feet or closer to the camera. During the day, the camera uses natural light, so you don’t have to change your blocking set up during the day, as those diodes are not used. Once I grew comfortable with still photos, I started to shoot 10 second video clips, and this opened up new doorways to learning. Below are brief blurbs describing each of the 29 videos I have currently published on YouTube. In time, as I publish more from my extensive photos of HHA and Hopkinton History in the past decade, I will publish those in similar articles on the HHA Web Site, so check back in! I have surrendered and no longer engage in futile efforts to keep the squirrels out of the bird feeders. Given enough years walking the planet, you also will value a lower blood pressure reading, rather than being continually humiliated by a tree rodent with a brain the size of an almond. As we said in the days of yore “Go with the Flow!”. Accordingly, the first 6 videos focus on the abundant Gray Squirrels, particularly around my home on Tomaquag Road! 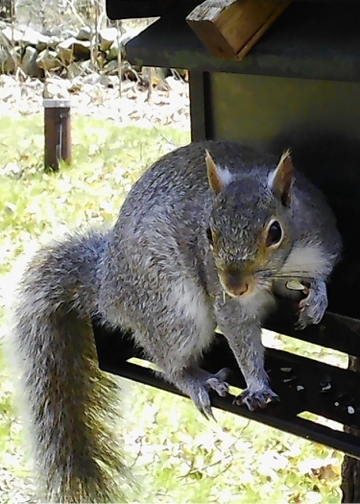 In this 50 second video, a Gray Squirrel does what Grey Squirrels do, attempt to eat everything in your feeder! A Grey Squirrel approaches the feeder cautiously. The coast is clear, what could go wrong? Then it has to look to see if anyone saw it goof up! So you think squirrels inhale food like little furry vacuum cleaners, don’t you. Well in this Slow Motion clip, at 1/5 normal speed, you can see that squirrels actually DO chew their food! The camera is only 2 feet away from this Gray Squirrel. You will begin to see new details as it goes about living. Thanks to my home made camera sight, I can aim the camera to shoot from 14 inches away. Everything you wanted to know about how many whiskers a Gray Squirrel has is revealed in this extra close video! In this clip of a Gray Squirrel 14 inches from the camera, besides being extra close, time is slowed down to 1/5 of normal speed, allowing you to see that squirrels chew like eating pizza, not drink like strawing a milkshake. Red Squirrels are 2/3rds the size of Gray Squirrels, and are rarely seen except in localized environments. In our neighborhood they usually have enough attitude to make the big gray ones get out of the way. They move so fast, that as a household, we have decreed that all Red Squirrels are named “Zippy”. In these 5 videos, you will see why. 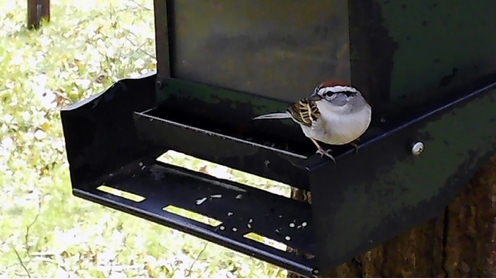 As the game camera has no audio, you can’t hear them, but they are very vocal, and delight in calling you names when you’re being stingy with the seeds. If you watch carefully, you can see them barking occasionally. Red Squirrels have retired the trophy for the Cutest Rodent in the Daytime Category. I have never read about this, but in our neighborhood, we have Red/Gray hybrid squirrels, one of which is starring in this video. If you look close in areas where red and gray fur meet, you will see the gray fur is longer. Parasites such as ticks are a plague on everything in the woods, our dogs and cats, and us. Even Zippy! Several times in my hiking the woods of Hopkinton I have spotted the big gray hanging nests of White Faced Hornets, but usually in the Fall, when the leaves are off the trees. Not so with this catastrophe waiting to happen, in a evergreen tree 8 feet from the side of Tomaquag Road, near the entrance to my next door neighbor’s driveway. The books say that a big nest can have thousands of bad attitude occupants within. In the Winter, when times get hard, Deer will come and lick seeds from my front yard feeders. This was shot at night when we turned on the flood lights. One night, while walking the dog in the front yard, I saw small gray shapes moving up and down one of our oaks with a flap feeder. Wandering closer I saw they were a group of about 6 Flying Squirrels! When the dog went in, I came back out with my regular camera and its flash. I was able to get extremely close to them, 10 inches in this still photo, 15 inches in the video shot at night with the video camera’s light. They move so fast with such quick reflexes that I was not perceived as a threat. In this hand held video, I move around slowly to shoot at different angles and distances. 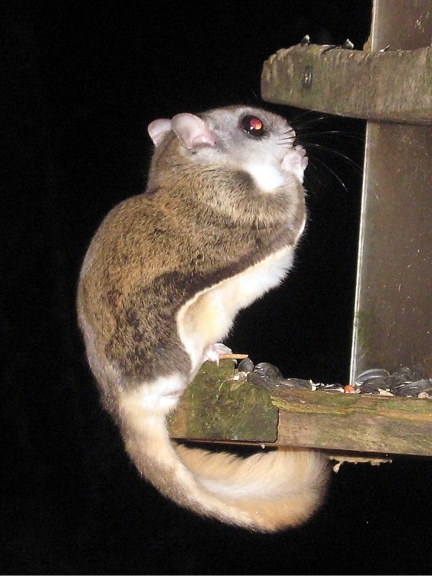 The Infrared Detectors in the Game Camera can pick up the diminutive Flying Squirrels when the camera is close, in this case 4 feet away. When it rains today, human activity outdoors seems to vanish, but for the wild animals, it is just another day, or night, trying to find something to eat, while avoiding being eaten. 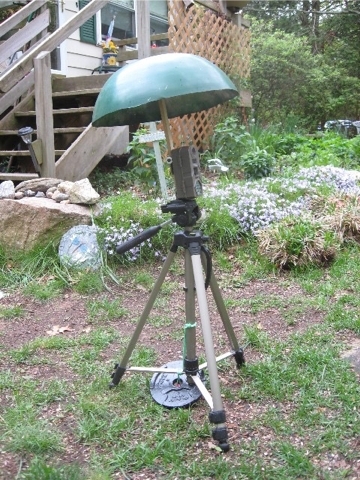 While the Game Camera is reasonably water resistant, rain drops on the lens will distort the image, so I cobbled together a rain hat for mine as seen in this photo. The animals and my camera umbrella got their first test in a light rain, so if the animals were out in the bad weather, so would my gear be out with them. Please Note that I was snuggled warm and dry in my bed while all this rugged stuff was happening! In between times when the raccoons dominated the feeder, the Flying Squirrels had their chance to snag some seeds. Currently it is Raccoon Season at night in my front yard. At other times and seasons I have photos of Fox, Skunk, Opossum Deer and Coyote, but for now, Raccoons are what the camera sees. This was shot from 8 feet away. Again from 8 feet, here a Raccoon is enjoying pigging out on free sunflower seeds when a second Raccoon climbs up the tree. “Shades of the Sixties!”, the new one proceeds to hold a ‘Sit Down’ demonstration to protest equal time! Who knew there were “Peace and Love” demonstrators among Raccoons! This second time, after enduring a nip on it’s rump, the “Back Slider” finally wins the prize. There is a “Pecking Order” of dominance among chickens and Raccoons. Out here, the Grand Poo-Bah of Raccoons is Mr. Big! Every other Raccoon gets out of it’s way. Sooner or later, even my feeders run out of seeds, as this Raccoon finds out in a desperate search. It reminds me of myself, hoping to find some goody buried in the freezer. In some of the early Raccoon videos, it seemed like on their rear paws they had a central big toe, and a similar central big toe on their front paws. In subsequent videos I looked for this to get clarified. As the following 2 videos make clear, while they favor bringing certain digits close in some situations, their toes splay out as our fingers do. And just when you think this is a still photo, the raccoon moves! Nope, for some reason I figured someone would want to count how many “Fingers and Toes” a raccoon has, so this was uploaded in slow motion, at 1/5 of regular speed. When I started shooting the Raccoons from only 2 feet away in an ‘Extra Close Up” format, far more detail becomes apparent. In this series of Close Up formats, shot from 3.5 feet away, look at the little details that now become clear. First off, Raccoons eat with their mouth open, and second off, what great big teeth they have! This is probably why my Mom always told me to wash behind my ears and never pet the Raccoons. Maybe they don’t do that in Rhode Island, but in New Jersey, we did lots of things different! There is a very good reason all Raccoons wear those “bandit masks” around their eyes! Its because they cannot help themselves! 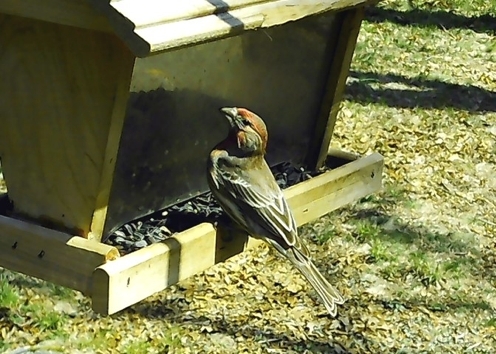 If there is a feeder in my yard they can reach, they rob it! Earlier I pointed out there was a Raccoon counter culture of “Peace and Love”. Well, surprise, surprise, Raccoons also have bullies, as this video, complete w a slow motion replay, makes clear. An adult Raccoon may weigh 35 pounds. (A big bag of sunflower seeds weighs 40, very close, to give you a comparison). 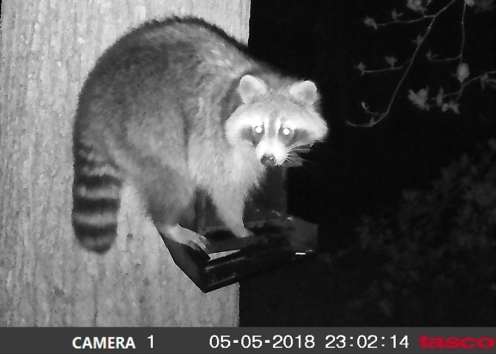 The feeder sometimes get’s trashed, and in this video, with the seed box knocked ajar, the opportunistic Raccoon simply reaches in through the opening at the top.